I'd heard a lot about Sanderson's books - most of it exceedingly good - from sites such as A Dribble of Ink, and the announcement of TGS clinched it for me: Brandon Sanderson's books became must reads on my list. Unfortunately, it wasn't quite that easy to grab a copy. Sanderson's books are difficult to find in the UK - in fact, I was forced to wait until my recent trip to Canada to obtain a copy of Elantris, Sanderson's debut novel. 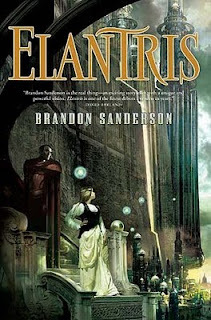 And Elantris certainly is a fascinating debut - some aspects read like a long-established novelist's technique, and others yet as if the reader was some new protagonist in a videogame (in fact, the same feeling seems to remain in The Final Empire - Aidan Moher and the comments below the review of the second volume remark upon this marked similarity). Sanderson certainly is an intriguing author. Elantris' main storyline commences far more rapidly than those of most fantasy novels: our central protagonist, Prince Raoden, is taken by the Shaod in the first chapter. But before we may understand this, it's necessary to look in detail at the urban setting of Sanderson's debut. In the area in which our story is set, denizens could become Elantrians - godlike beings taken by a transformation that gave them the abilities of sorcery: and compel them to live in Elantris, the city and temple to these beings. But they key was that the Shaod could take anybody. But then came our fairly typical fantasy cataclysm - something went wrong. The Elantrians became withered, frail entities that were nevertheless unable to die. The Shaod became an exile to eternal pain, hunger, and imprisonment in the city of Elantris - no longer pristine, but ransacked, grime-stricken, and starving. But Raoden sets out to forge the broken Elantrians into a nation - a futile endeavour. Meanwhile, his as-yet-unmet widow, Sarene, travels to assume her position at the foot of Raoden's father, and begins to question Arelon's already-dubious nobility. And presenting the side of our initial antagonists, Hrathen, a Derethi High Priest with a mandate: convert the people of Arelon to Shu-Dereth within three months, or witness the city's invasion. He sets out to sway Arelon's mercantile aristocracy - and place a bribed, untrusted aristocrat on Arelon's throne. An interesting plot, indeed - and Sanderson's magic is logical and intriguing, and well deserves its position as the keystone of Arelon's plotline. The conclusion is likewise perfectly balanced between plotlines (although a tad neat). Sanderson's urban environs are believable, and the political intrigue might be cosy, but it certainly does create a fantastic atmosphere for the city of Kae. The one real complaint I have is that the conclusion is slightly too neat; and the resolution of Elantris a little fast (seeming like a stereotypical Deux Ex Machina). Nevertheless, Elantris is a very worthy read, and I can only cheer Sanderson on for such a masterful debut. Hi, I'm Parajunkee, and I just have to say I really like your blog. You should stop by and check it out. I'm now also following! I do have to say if you can get Brandons other works he will NOT let you down. I have read Elantris already and for a debut book all I can say is amazing. He completely thinks out his magical systems in such a way it is just mind blowing. If you can get the Mistborn trilogy and his new one Warbreaker you will be pleased. Each has a different magical system to it and from what he says he has many more to write about. Mistborn I think is my favorite. However, Elantris and Warbreaker are not far behind. Such talent with this writer!